Are you looking for the best GRE prep books for 2018? Have a look at our hand-picked list of the Top 10 best GRE books and read reviews on why we think these guides are the most effective study books for the test. You may also want to check out our overview of the best GRE prep courses and GRE prep tips. Comprehensive does not begin to describe the content provided in the Manhattan Prep GRE Set. Offering eight individualized guides to each of the main topics tested on the GRE, this set – now in its revised 4th edition – offers a plethora of information and strategies as well as six online practice tests. Nevertheless, as each of the topics is contained in a separate book, the information and guidance provided does not feel overwhelming. The eight books include guides on Algebra; Fractions, Decimals, & Percents; Geometry; Number Properties; Quantitative Comparisons and Data Interpretation; Word Problems; Reading Comprehension & Essays; Text Completion and Sentence Equivalence. The books also feature lists of common words to use to boost overall score, and plentiful practice questions. The focus on math is particularly impressive. The guides were written by Manhattan Prep, an established producer of study guides with experience covering a wide range of different exams. The organisation of the guides can also be a little confusing at times, and occasionally the material is too simple, neglecting important information. Because of the vast amount of content contained in these eight guides, this set is not useful for the last minute crammers. However, for those with time and a dedication to the GRE, this is one of the most useful and best GRE prep book systems. While the Official Super Power Pack will not win any awards for its ability to provide sophisticated tips and techniques on writing the GRE, it is still essential to have access to materials from ETS, the official writers of the GRE. This discounted bundle consists of The Official Guide to the GRE and two books filled with authentic GRE practice questions for Verbal and Quantitative Reasoning. In addition to offering a good introduction to the test, these books provide plenty of practice, detailed examples of real answers provided by test takers, and expert commentaries by those who actually grade the GRE. This means that the questions are genuinely similar to those in the real test, giving this guide a credibility that others don’t possess. Moreover, the set, together with its accompanying CD-ROM, provides four authentic GRE practice tests. These are complete tests, and the digital versions come with some useful features, such as the ability to review answers. There are, in total, more than 600 exam questions within the pack, along with sample essays, making it a formidable source of practice material. Test-takers should note that this set does not give many tips or “tricks” on writing the exam and some of the explanations are overly complex and difficult to understand. This means that it requires supplements in the form of other study guides. This resource is geared toward practice, so it doesn’t devote too much energy towards teaching new material and explaining concepts. It assumes some existing knowledge on the part of the reader, so it’s perhaps best suited to those who are already comfortable with the topics and want to practice taking the test. Nevertheless, given their official nature and authenticity, these books are a must-buy and easily make it onto our list of the best GRE prep books. Test prep powerhouse Kaplan now offers “GRE Complete”, designed to be a full-fledged test prep system. Having been in the business for 80 years, Kaplan is one of the most respected study guide creators out there. They’ve worked with over 90 different standardized tests and are known for using technology to boost the effectiveness of their guides. GRE Complete 2018 includes Kaplan’s three best GRE prep books: GRE Prep Plus; GRE Math Workbook; and GRE Verbal Workbook. Together, they deliver thousands of practice questions and explanations. In addition, the pack also gives users one year of free access to a plethora of online resources, accessible from any mobile device with an internet connection, including a customizable GRE Quiz Bank with over 1,000 questions; five adaptive GRE practice tests that simulate the real exam; online study plans; and a DVD with information and advice on test-taking and graduate school applications. They also offer advice and support on dealing with exam stress and related issues. The heart of this set is the top rated and brand new GRE Prep Plus book. Written in a format that is easily digestible, this book’s main strength lies in its easily employable test writing strategies, its wealth of practice materials, and its full-length practice test (in addition to the 5 tests that this set also offers). The online materials aren’t quite perfect, though. While we didn’t encounter any issues in our tests, we are aware that there have been some reports of problems when loading the content and logging in. Overall, however, this is a truly excellent, feature rich study companion offered at incredible value. The combination of top books, GRE question bank, mobile access, and online tools provides for highly effective GRE preparation. With its mobile-enabled study resources and iPad download, the set is also ideal for studying on the go. In addition to the Top 3 listed above, we also highly recommend the following GRE preparation books that complement our Top 10 list. If you have specific feedback on these or other titles, please don’t hesitate to get in touch and share it with us. The masterminds behind an impressive empire of online test-prep materials, Magoosh have now released a study guide for the GRE. It’s packed with useful tips and strategies, delivered in a friendly and engaging tone that breaks complex topics down into easily understood language. It covers all three major areas of the test, with over 130 practice questions complete with answer explanations. There’s also a full-length practice test. This book complements Magoosh’s online materials well, and can be used alongside their web course. Magoosh take pride in their reputation for good customer service, and regularly update and improve their online resources. They even refine their practice questions based on feedback from customers. Although the guide doesn’t contain an enormous amount of practice questions compared to some of its competitors, the quality of the questions is enough to give readers good practice. However, they are not real GRE questions, and students in search of these may wish to seek out more official books. In terms of layout, quality of material, and comprehensiveness, however, this is one of the best GRE prep books on the market and should not be ignored by any potential student. A good comprehensive foundation book, The Princeton Review’s Cracking the GRE Premium Edition 2018 offers a general overview of the test and general lessons on strategy as well as individualized tips and strategies for each section of the test and a vocabulary list. The book was written by Princeton Review, a company that has been providing help and support to students through a variety of mediums since 1981. The guide includes access to online video tutorials and advice as well as two full-length GRE practice tests with detailed explanations. Moreover, the book provides access to four additional online tests with comprehensive score reports, downloadable study guides, and other resources. There’s also a premium edition at a higher cost, which includes features such as help with the application process to schools, video guides, and further assistance on creating study plans and organising learning. In general, as in previous editions, the book’s main strength lies in its explanation of the verbal section of the test. For the math section, however, its explanations are often too simplistic or insufficient. It may be useful to supplement this resource with some more detailed and thorough materials for the best results. Apart from its weakness in the math area, the book is well written, easy to understand and very effective at building confidence in test taking abilities. The readable, friendly tone sets the guide apart from other, more dense and boring resources, and helps keep readers engaged and positive. McGraw-Hill’s latest offering for the GRE provides a systematic guide to surmounting the test. Beginning with the provision of a diagnostic test, which allows test takers to identify their shortcomings, this book covers each of the aspects of the GRE by providing a review of substantive concepts, examples of each of the different questions types a test taker may encounter, as well as tips and tricks for navigating specific sections. The book was written by Erfun Geulan, a perfect scorer on the GRE who has since founded GRE Compass which tutors GRE candidates. He brings a wealth of experience and skill to the table, ensuring the advice within the pages is reliable and useful. In addition, this study guide provides helpful tools for engaging with the test’s analytical writing tasks. Of particular note are the five additional full-length sample GRE tests – with answer explanations – it offers (in addition to the diagnostic test). This enables test takers to practice, practice, practice; honing their GRE test taking skills. McGraw Hill has also fully embraced technology with this book by offering test takers access to the Premium Practice Test App. This enables students not only to take full practice tests on their tablets or smartphones, but also provides access to 20 instructional videos on selected GRE topics. It also helps students develop study schedules through use of the McGraw-Hill Test Planner App. Providing helpful, easy-to-understand explanations and interspersing strategies, Preparation for the GRE Test is extremely reader-friendly and useful for improving GRE skills. These qualities, combined with the online apps, make this title one of the best GRE prep books currently available. The book is particularly valuable when it comes to math – something many other GRE prep guides fail to adequately tackle. This alone makes it worthy of consideration for those who struggle with the math-based sections of the test. Available now in a newly revised edition, Barron’s GRE is a highly comprehensive books that offers individualized coverage and strategies for each section of the GRE (Verbal, Analytical, and Quantitative). In addition, this guide offers a diagnostic test and two model tests with detailed answer explanations. There is also an optional extra CD, which comes with a further two tests and explanations. Moreover, readers get free access to Barron’s Online GRE Course, which includes features such as video tutorials, quizzes and additional practice questions, and a GRE study iPad app. The book is useful when it comes to the Quantitative (math) section, providing comprehensive coverage of topics and helpful advice on how to approach questions (although these occasionally miss out information). It’s a little less useful when it comes to the Verbal section, so may not be ideal for those who wish to focus on this side of things. The content is sometimes a little patchy, and the material, while useful, can sometimes be different to that of the exam itself. The authors of the book are not GRE test setters, so the practice questions aren’t as accurate as in some other guides. While the book itself may not be as easy to read as others on our Top 10 list of the best GRE prep books, those who already have a good basic knowledge of the tested skills can benefit from the book’s approach to mastering the tougher questions. Focusing only on the Math section of the GRE, this book – authored by math ninja and president of Nova Press, Jeff Kolby – does a superb job of breaking down the constitutive elements of the Math part of the test. It contains 164 examples and more than 600 exercises to allow readers to test their knowledge and familiarise themselves with what needs to be done in the test. Importantly, this book categorizes each of the different types of math questions into their own section, such as Fractions, Geometry, Averages, Graphs, etc. This allows a test taker to focus on building up skills for each type of math question. Even better, the book breaks down the sample problems into difficulty levels of Easy, Medium, Hard, and Very Hard, enabling the test taker to slowly work their way up the difficulty chain. There is a good amount of focus on strategy and how to avoid the traps and tricks that are present in many of the GRE questions. On the other hand, questions can occasionally be too complex, and contain too many problems, making the process frustrating and demotivating. They also differ from the real GRE test. What’s more, the difficulty level is fairly advanced from the beginning, making the material difficult and off-putting for those without a strong math background. It’s not a guide for refreshing old knowledge and requires a certain amount of existing ability. While this guide could be a little more accessible, and may not be the best choice for math newbies, it is overall one of the best GRE books, and a must for surmounting the test’s Quantitative section. Fretting about math on the GRE? No need to with this almost 500 page manual of math assistance. In addition to devoted sections to every type of math problem one could encounter on the GRE, CliffsNotes offers a well thought out strategy to mastering the extensive contents of this book. The book provides test takers with a diagnostic test that is designed to be taken at the outset with the aim of highlighting areas of weakness. Test takers can then focus on problem areas. The book covers a variety of math areas, including algebra, geometry, and word problems. There is also a host of practice questions for readers to test what they have learned and check their progress. The focus of this book is on speed and efficiency, so it works well for those who are short on time and, conversely, may not benefit those who want in-depth knowledge and training. The simple and clear nature of the material makes it ideal for those who aren’t particularly gifted at math or are looking to get started in this area. For more advanced students, or those aiming for the highest scores in the GRE math section, it may be inadequate. It’s also not specific to the GRE, so some of the content may be irrelevant. For beginners or those looking to refresh knowledge quickly, this is a very thorough book that helps build up math skills from the ground up. A must buy! Written in an easy and engaging style, typical of the Dummies series, the latest GRE for Dummies book still provides a good review of all of the components of the GRE. However, it now also comes with full-length online GRE practice tests and practice questions. What’s more, the book also looks at strategies for coping with the test and how to prepare properly for it. It covers all three sections of the test. If you don’t have much time to study, or a perfect score isn’t of the utmost importance, this book is a great way to study for the GRE. It breaks the necessary information down into digestible chunks, and covers all of the important areas of the test. It also allows you to test yourself frequently. On the other hand, students who are aiming for a top score in the GRE may become frustrated with this guide, and should consider something more detailed and advanced. Some of the explanations lack depth and don’t contain enough information to really prepare readers for getting a perfect score. Overall, while the difficulty level of some of the practice questions could stand to be higher, this is a solid and fun book, which still makes our Top 10 List of the best GRE prep books. An essential tool for increasing your vocabulary, this book – now in its 4th edition for 2017, provides an extensive 800 word list of the most frequently occurring words on the GRE. It was written by Philip Geer, a 30-year veteran of English language and literature teaching, and an expert at helping students prepare for verbal tests. The guide gives instructions on learning common roots and prefixes as a means of deciphering new, unknown words; a pre-test which highlights areas of weakness; concise definitions for words on the word list, and post-study practice exercises to confirm test takers’ understanding of new words. Helpfully organized into 10-word bite sized units, this book makes a seemingly insurmountable task like learning 800 new words into a manageable activity. It targets vocabulary learning like no other guide, making it indispensable for those who wish to focus more on this part of the GRE. Of course, it’s important to combine the book with others which focus on different sections of the GRE. The guide is also fairly memorisation-focused, so if this is something you hate it may not be the ideal resource for you. However, it is highly recommended as one of the best GRE prep books for the test’s Verbal Reasoning section, and a must-have for anyone wishing to maximize their Verbal score. If you are reading this, you probably already know the answer. The Graduate Record Examination – or GRE – has become a must-have for many graduate school applicants. It’s a standardized test, administered by ETS, which covers a range of different skills and gives applicants the chance to prove their worth to schools. The test can be taken all over the world, is sat by more than 500,000 people every year, and is accepted at thousands of institutions. What’s more, the GRE allows candidates to send only their best scores, to give the most positive picture possible. In today’s ultra-competitive job market, it’s important for graduates to do everything they can to get ahead and stand out from the crowd. One sure fire way to gain an advantage is by going to graduate school, and there are numerous clear advantages to taking this route. Some people question the value of graduate school, but the stats are clear. Getting a Bachelor’s degree in the US will, on average, result in an annual salary of $42,877. A Master’s degree or higher, however, will net you an impressive average salary of $55,242. That’s an enormous difference. Taking and mastering the GRE can be your gateway to following your passions, secure higher paying jobs, and study at the best schools in the country. There are many things college graduates can do to boost their chances of reaching the next rung of the educational ladder – and these options often begin by taking and scoring high on the GRE exam. One of the best ways to maximize your chances of success in the GRE is by investing in a good prep book – indeed, it has to be the best GRE prep book. Fortunately, there are several of these available, and they are extremely useful in preparing for the test. There are several top GRE prep books out there, and each has its own strengths and weaknesses. If you’re working on a budget, it might be best to look for a guide that covers all areas of the test in reasonable detail. The GRE is split into three sections – Verbal Reasoning, Quantitative Reasoning, and Analytic Writing. These allow students to show off a broad range of skills and impress prospective schools. Some books focus more on certain sections of the test, such as math, so it may also be useful to identify your weak areas and choose a book accordingly. It’s also important to pick a guide with a good array of practice questions and exercises. These are an excellent way to become familiar with the types of questions in the exam, and also allow you to pinpoint the skills that require more work. Other important factors to consider when choosing a prep book are the structure, layout, and tone. These may not seem hugely important, but it’s important to enjoy the material and avoid becoming turned off by a guide that is too boring and dry. Finally, many GRE prep books come loaded with extra features and materials. These can include online tests, DVDs, and apps, all of which add value to the resource. While study guides are undoubtedly a must-have for any student approaching the GRE, they are by no means the only resources out there to help prepare. The internet is brimming with guides, e-books, and courses to give GRE candidates that extra push towards a high score – and many of them are completely free. Here, we’ll go through the best ones out there. From the makers of the GRE themselves, the ETS Powerprep resource is simply invaluable for anyone considering this test. It consists of a series of free practice tests to help candidates become familiar with the GRE exam and their own abilities. Not only do the tests contain real GRE material that closely reflects what students can expect in the exam, but they also use exactly the same format and interface as the GRE. So students can gain an idea of how the exam will look and feel before they take it. The Khan Academy is a more general resource, and doesn’t have a section that specifically deals with the GRE. That said, it’s still renowned for its educational content and is an invaluable aid to anyone hoping to increase their knowledge. GRE candidates can use the Khan Academy to brush up on certain areas, such as math, by taking courses and focusing on particular topics. It’s a great way for students to go in-depth into areas they’re finding tough, and work through any gaps in their knowledge. We also recommend StudyCrossing. This is a startup platform that aims to connect test-takers and test prep experts. It lets you find GRE study groups and study partners. You can choose to join an online study group or a meetup group that gets together in your town or city. You can also start your own study group and invite other users or your friends to join. 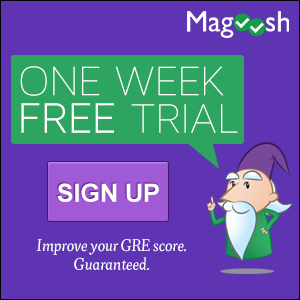 Magoosh, as mentioned above, are responsible for a huge amount of online content relating to the GRE, and their free app is a great tool for anyone preparing for the exam. It offers access to Magoosh’s archive of blog posts, video materials, practice questions, and study guides tackling numerous aspects of the test. It works on Android and iOS devices, and comes with a pleasant interface which is easy to navigate. The benefit of the app is that, unlike many other resources, it can be used on the go, making it extremely convenient for those who spend a lot of time traveling or away from the desk. It explains concepts clearly and easily, and works smoothly most of the time. The Magoosh team has also created an eBook, which is essentially a collection of all of their blog posts on the GRE. It contains valuable strategies, study plans, and other resources, and deals with all the sections of the exam. Quizlet is an excellent resource for learning large amounts of information, allowing users to create sets of data and memorise it through a series of exercises and games. It’s completely free to use, rarely encounters any glitches, and helps make the memorizing process far less mind-numbing than it can be. This site is well suited to the Verbal section of the GRE, which requires students to memorize huge lists of words and word roots, although there’s no reason it couldn’t be used for other areas of the exam too. Veritas Prep is devoted to helping students prepare for a variety of tests, including the GRE. Their extensive online library of resources includes online classes (including a free trial class), strategy sessions, and advice on time management, alongside a plethora of other useful information. Many of their services are somewhat pricey, although there is also a fair amount of free material on their website, including blog posts and articles about the GRE. They work with some of the most highly acclaimed GRE tutors in the world, and can certainly promise quality assistance for those with the ability to pay for it. Finally, you can always get creative and use your own resources to study for the GRE. This could include things like flashcards, colored diagrams, and organizing study groups with friends. The GRE is a tough test, but as we have seen there are lots of useful resources available, which can really help candidates get the biggest possible advantage and take on the exam with confidence and skill. Good luck!